Hello Georgia Orthopedic Society colleagues and Happy New Year. On behalf of your Board and as one of your representatives on the AAOS Board of Councilors (along with Wendall Duncan and Chairman Danny Guy) I have a request. It will take less than 5 minutes and if you pick up your phone you can do it right now. Please scan the note below from John Gill, an orthopod colleague from Texas and the Chair of the AAOS political action committee. It speaks to how strong Orthopaedics is in the world of advocacy in Washington. It doesn’t just happen. It takes folks like Dr Gill and a salaried AAOS staff along with a few hundred others of us that volunteer time to work the process. Making a contribution to the AAOS PAC is an easy way for you to support this process. You don’t even need to do any of the heavy lifting. The AAOS PAC (along with our GOS PAC) is successful because of the financial support it’s members give. Like it or not, this is a small piece of overhead that is part of the price of your practice. Please pick up your phone; enter AAOS in the text field and 41444 as the number you send that message to. You will quickly receive a text with a link to a website where you can enter a dollar amount and payment method. Choose any $$ amount you want. No amount is too small. I also have a personal reason for writing. Like you, I’m kind of competitive. The BOC (board of councilors) has a little competition as to which state can have the highest percentage of AAOS members make a contribution to the PAC in 2017. I want to be able to announce to you that Georgia orthopedists came out # 1. So do this today. We have until December 31. Thank you for your previous support of the AAOS Orthopaedic PAC, the largest provider PAC in the nation. We want you back on the team. It can sometimes be hard to break through the headlines, but we have had a banner year! On the federal front, we have made significant progress towards vital medical liability reforms and repealing the harmful Independent Payment Advisory Board (IPAB). We also negated harmful legislative language declaring podiatrists physicians and protected vital defense health research funding. On the regulatory side, AAOS has responded to several requests for information, proposed rules, and other documents about the need to reduce many of the day-to-day burdens that orthopaedic surgeons face. We also successfully obtained a CMS code change for total ankle replacements that more accurately reflects the difficulty of the procedure, canceled the SHFFT mandatory payment model, scaled back the CJR mandatory payment model, and convinced CMS to withdraw a harmful proposed rule on orthotics/prosthetics. Politically, the Orthopaedic PAC had unprecedented access and representation at over 600 political events, an increase of more than 30 percent from last election cycle. The strength of our PAC has allowed us to have a seat at the table and educate members of Congress about the importance of musculoskeletal care. We represent our profession, patients and your practices – not red or blue – and we work hard to make sure your issues are heard. However, there is still much more work to be done in 2018. Can we count on your support this year as we rebuild our war chest to ensure we protect physician reimbursement, lift the ban on physician-owned hospitals, and achieve important antitrust reform? Our PAC just isn’t the same without you! Please renew your investment in the future of our specialty. To renew, text the word AAOS to the number 41444 or visit www.aaos.org/Pac. Please let us know if there is anything we can do for you. Orthopaedic PAC works for all orthopaedic surgeons, all the time. Have a wonderful holiday season. We live in a sports-crazed society and often hear about the importance of relationships when it comes to successful teams. Well, success in advocacy is no different—it requires strong teams and positive relationships. This notion was the primary take-home lesson I learned while "running point" on the efforts of the Georgia Orthopaedic Society (GOS) to align Georgia';s sports medicine laws with those of other states. In most of the United States, a limited medical licensure exemption applies to out-of-state team physicians. The issue at stake is all too familiar to physicians, trainers, and other medical staff who travel across state lines in support of their athletic teams. Professional licensure always has been the purview of the states, not the federal government; therefore, no national-level medical license currently exists. Physicians who practice in multiple states must obtain and maintain multiple licenses. Such multilicensed physicians are usually found in "border towns" that straddle several states. For example, in my hometown of Rome, Ga., we serve patients from three states (Georgia, Tennessee, and Alabama). Georgia Orthopaedic Society members and friends celebrate the signing of the Georgia Visiting Physician Protection Act by Gov. 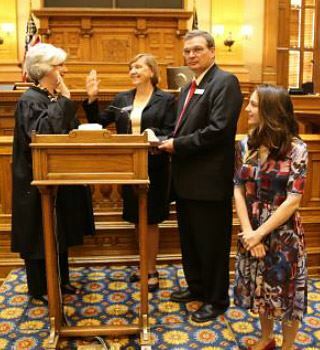 Nathan Deal. This arrangement might make sense for someone who needs a license to obtain hospital privileges or open a medical office in a neighboring state. Although licenses are expensive to get and keep, they are a necessary cost of doing business for these doctors. For sports medicine physicians who spend very limited time "on assignment" for a road game or other athletic contest, the situation is vastly different. In an age in which college teams from the Big East routinely play west of the Mississippi River, team doctors face a conundrum. Licensure in the state visited on every possible road trip is simply not practical. Doctors are left hoping that the state their team plans to visit has a licensure exemption for sports medicine. If not, they could face professional risk. Alternatively, team doctors may choose to stay home and leave their athletes to whatever care may await them on the road. Our friends and champions at the federal level have met stiff opposition in trying to achieve a national-level solution. As such, orthopaedic surgeons have led a state-by-state campaign to create laws to protect visiting team physicians. Even at the state level and in spite of the hard work of many of my colleagues within our state orthopaedic society, prior efforts to secure passage of our "sports med bill" had stalled. The state medical board worried about precedent and a "slippery slope." The governor';s office worried about opening the door for "pill mills." The national environment made almost any healthcare-related law a significant liability for a sponsoring legislator. Indeed, the deck seemed stacked against us. Last summer, however, the proverbial planets seemed to align. As a participant in the Georgia Physicians Leadership Academy (an advocacy program sponsored by the Medical Association of Georgia [MAG]), I had to choose a "class project." As I weighed options involving community service, patient care, and other themes, I ultimately chose a path that seemed to me like Robert Frost';s "The Road Not Taken." With encouragement from senior surgeon-mentors, including Todd Schmidt, MD, and Xavier Duralde, MD, I set a goal of protecting our out-of-state sports medicine colleagues when their teams visit Georgia by ensuring the passage of a bill through our state legislature in 2017. In the beginning, all I really knew was that it was a good idea to contribute to the American Association of Orthopaedic Surgeons (AAOS) Political Action Committee and our state political action committee because they managed political aspects that I did not understand. And while money is certainly important, I quickly realized that money is irrelevant without relationships. I met with lobbyists from the teams that work for GOS and MAG, who helped me plan the steps necessary to reach our goals. They all agreed that this was a "white hat" issue—one that held very little controversy or political risk. It was mind-blowing, however, to see how much work was still involved to get to the finish line. First, I had to find a formal sponsor for the bill. That part was relatively easy. Our state senator, Chuck Hufstetler (R-Ga.), is a good friend and works as an anesthetist in one of our local hospitals. I met with him for coffee and he cheerfully agreed to be the "legislative champion" of the bill. I created draft language by using a template from the American Orthopaedic Society for Sports Medicine (AOSSM). Sen. Hufstetler then leveraged his legislative counsel to create a version viable for the 2017 session. Meanwhile, I had to "get everyone on board" with the idea long before the legislature met in January. I worked with the governor';s chief advisor on health affairs to make sure that the bill fit in the governor';s agenda for the year. I worked with the State Composite Medical Board to explain the details of the bill. We reassured them, for example, that our plan would not lead to bigger issues, such as cross-state compacts. Fortunately, I had an ally—Ronnie Wallace, a local banker and businessperson from Rome who happened to be the medical board';s lay member. Mr. Wallace understood the importance of the issue for events like NCAA bowl games and even the NFL Super Bowl and remained a staunch supporter throughout the process. Other meetings followed with leadership and key legislators in both houses, explaining to them—over cocktails, dinner parties, and late-night phone calls—why they needed to support the bill. At each encounter with the various legislators, lobbyists, advisors, and other stakeholders, I came armed with a "white paper" in support of our bill. It contained an executive summary, model language for the Georgia bill, examples of successful bills in other states, media coverage of the stalling national-level efforts, and other critical background information. The key piece of the white paper, however, was the section with support letters. I had collected crucial letters from my friends and colleagues who worked as team physicians across the state and across the country who gladly took the time to explain the importance of the bill. Again, the power of relationships was on full display. Once the Georgia General Assembly opened, the formal process began in earnest. It was like watching the old Schoolhouse Rock "I';m Just a Bill" video, but in real life and in slow motion. The bill began in the Senate as "Senate Bill 47," which then had to pass out of committee. I went to Atlanta to testify at the committee hearing, expecting a small room with a handful of bored legislators. Instead, I walked into a cavernous chamber filled with lobbyists, reporters, and countless others. I almost ran out; however, with some coaching from Sen. Hufstetler and our lobbyist team, I was able to get through the hearing. In the end, we got the bill out of committee unanimously, and it then went to a vote in the Senate. It passed unanimously out of the Senate as well—thanks in no small part to a multitude of phone calls from GOS members to their senators encouraging support for the bill. These phone calls proved most effective when members had an existing relationship with their senator. The process repeated itself in the House of Representatives. Another trip before a committee resulted in a unanimous favorable vote. The bill then passed unanimously out of the House in its one-word altered form, but the change in wording unfortunately required another Senate vote. As the end of the session loomed, Sen. Hufstetler masterfully guided the bill through the process, and it cleared the legislature. As Nathan Deal, our governor, signed the bill, he was flanked by many of the people whose hard work helped put the bill on his desk—members of the GOS leadership, Sen. Hufstetler, Mr. Wallace, and members of our lobbying team. I also invited my athletic trainer and the head football coach of the college that I cover because they represent the reason (to serve our athletes) that we started this process in the first place. I even brought along my wife and children, the most important relationships in my life, to reward them for their love and support during all the hours I spent on this project. Indeed, the group picture we took at the signing ceremony seemed to capture the team spirit and relationships that drove the whole process. It reminds me that no one can succeed alone in advocacy. Brandon D. "Brad" Bushnell, MD, MBA, is the chairman of orthopaedic surgery at the Harbin Clinic in Rome, Ga.—Georgia';s largest physician-owned, multispecialty clinic. He is a member of the AAOS Education Assessments and Evaluations Committee and the Appropriate Use Criteria Voting Committee for Surgical Management of Osteoarthritis of the Knee. The GOS board has opened nominations from membership for the 2017 GOS Jim Funk, M.D., Distinguished Service Award. This award is presented to one who has demonstrated an exemplary commitment to musculoskeletal-focused humanitarian activities and contributed significantly to improving the practice of Orthopaedic surgery. Nominees do NOT have to be GOS members nor do they have to be Orthopaedic surgeons. The nominee should simply meet the above criteria and be worthy of this distinguished service award. When submitting your nomination, please provide a brief narrative as to why you believe your nominee deserves this award. Please make your nominations soon as they will no longer be accepted for the 2017 award after July 1, 2017. The Award will be presented at the 2017 Annual Meeting of the Georgia Orthopaedic Society (October 5-8, 2017). It will be the 72nd anniversary so please save the date on your calendars! SAN DIEGO, Calif. (March 17, 2017)—Georgia orthopaedic surgeon Daniel K. Guy, MD, became chair of the American Academy of Orthopaedic Surgeons’ (AAOS) Board of Councilors (BOC) today at the organization’s 2017 Annual Meeting. The BOC consists of more than 100 members elected by state and regional orthopaedic societies including Puerto Rico, the U.S. military, Canada, and four regional societies. The Board serves as an advisory body to the AAOS Board of Directors and committees. The BOC also manages the Academy’s relations with state and regional orthopaedic societies and conducts a wide range of programs to strengthen and support the societies. Dr. Guy specializes in shoulder and hip surgery and sports medicine at Emory Southern Orthopaedics in LaGrange, Ga., and is on staff at WellStar/West Georgia Health System. He received his Bachelor in Science from Murray State University in Murray, Ky. and earned both a Master of Science and Medical Degree from University of Louisville. Dr. Guy completed his Orthopaedic residency at the University of Texas Health Science Center in San Antonio. After residency, he was selected to and completed an A-O Fellowship in adult reconstruction at the Inselspital in Bern, Switzerland. Dr. Guy is a Fellow of the AAOS and currently serves on the Academy’s Board of Directors. He is a Diplomate of the American Board of Orthpaedic Surgery and is a member of the Alpha Omicron Alpha Medical Honor Society. He is Past President and Board member of the Georgia Orthopaedic Society. Dr. Guy enjoys traveling, sports, reading and outdoor activities. He and his wife Jill have 2 children and 2 grandchildren. He is an elder at First Presbyterian Church in La Grange, Ga. Most of the GOS Membership reading this article are aware of the Senior Residents Conference we started in the Spring of 2012. This conference to prepare our Residents for practice has been a major success under the leadership of Dr. Steve Kane and has grown yearly. This June we will host our 6th Conference and will have Orthopaedic Residents from at least 3 other states attending. To enhance the position of GOS with our Orthopaedic Residents in Georgia, this year we have had Board members meet with the Residents at each of the 4 Orthopaedic Residency programs in Georgia: Emory University, Atlanta Medical Center, MCG at AU, and the Eisenhower Army Medical Center at Fort Gordon. (At the printing of this Newsletter we have completed all but Eisenhower). Encourage involvement in the Whitesides Resident Paper Competition for presentation at the GOS annual meeting. Explain the importance of Advocacy and participation in the AAOS and GOS PAC’s as Residents. We will later have a competition between the 4 programs to see who has the most Residents participate. 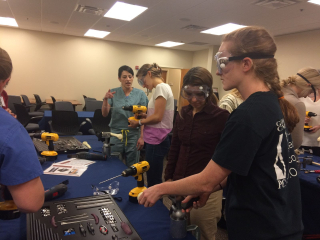 Discuss the importance of our State Orthopaedic Societies to practicing Orthopaedists. Encourage Resident membership in GOS (no dues) and attendance at the annual meeting at Sea Island (no registration fee). We are fortunate to have 4 exemplary Orthopaedic Residency programs in Georgia and we on your Board of Directors will continue to be committed to the enhancement of their education and preparation for future practice. The GSES Annual Spring Conference – Fractures of the AC Joint, Clavicle Glenoid & Proximal Humerus will take place on Saturday, April 22, 2017 at the Ritz-Carlton Atlanta (Downtown). 6.50 hours of AMA PRA Category 1 credits available. Click here for more details. (Marietta)—Republican physician and 30 year Cobb resident Dr. Kay Kirkpatrick announced Monday that she will run for State Senate district 32 to fill the vacancy left by incumbent Senator Judson Hill. Sen. Hill has announced that he will seek the open congressional seat currently held by Congressman Tom Price, who has been nominated by President-elect Donald Trump to serve as Secretary of Health and Human Services. 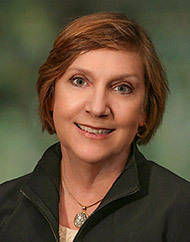 Dr. Kay Kirkpatrick is an Orthopeadic surgeon and former President of Resurgens Orthopeadics. She is a graduate of the University of Kentucky and earned her medical degree from the University of Louisville. She has served as president of the Georgia Orthopaedic Society and is Executive Director of the Resurgens Charitable Foundation She volunteers her time delivering pet therapy as a team leader at the Ronald McDonald House through the Happy Tails Pet Therapy Program. She and her husband, Thomas, an emergency physician, have two adult children and live in the Ashebrooke subdivision. They are members of East Cobb United Methodist Church. Some 75 physicians and 25 legislators attended the 2017 Georgia ‘Physicians’ Day at the Capitol,’ which took place on Wednesday. 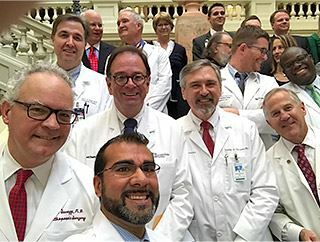 “This was a great opportunity for physicians in every specialty and practice setting to deliver some critical messages to state lawmakers in a very unified and powerful way,” says Medical Association of Georgia (MAG) President Steven M. Walsh, M.D. In addition to MAG, the event was sponsored by Resurgens Orthopaedics, the Georgia Society of Ophthalmology, the Georgia Society of the American College of Surgeons, the Georgia Psychiatric Physicians Association, the Georgia Society of Anesthesiologists, the Georgia Orthopedic Society, the Georgia Chapter of the American College of Cardiology, and the Georgia Society of Dermatology and Dermatologic Surgery. Thank you for participating in our recent Perry Outreach Program at WellStar Development Center in Atlanta, GA. Click here to view more photos. 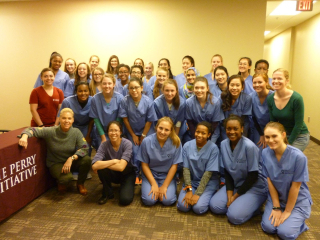 We were so impressed with everyone we met, and we know you will go on to do great things! Please keep in touch with us via facebook, twitter, and instagram links below.